Today is last day of the Blogging Marathon Edition #6 and for the last day everybody suggested we do something different. So I paired up two bloggers to cook from each other. I had the names against numbers and paired it by randomly selecting the numbers. We decided to manage however the themes that we choose. Like if one was doing Regional Special, they had the option of selecting the same ingredients from their partner or adapt the recipe with their ingredients. I was paired with Jay. I remembered this only yesterday and imagine my relief that I don’t have to break my head on thinking of a new dish myself. 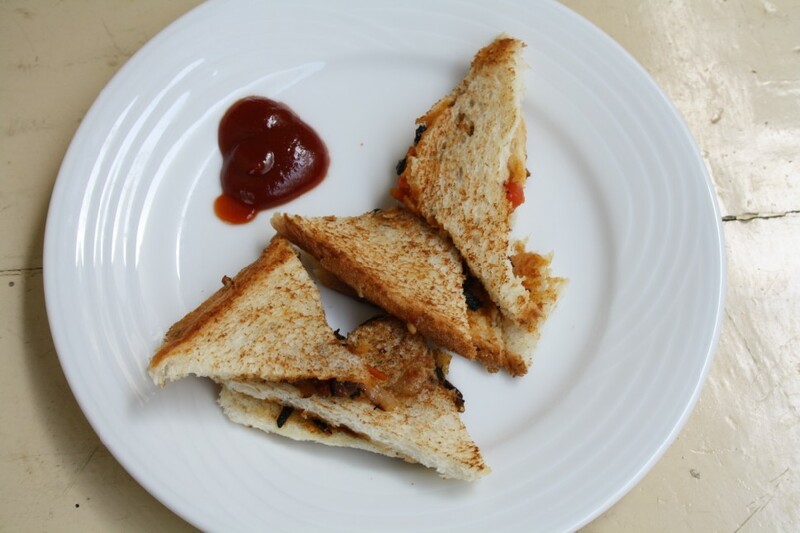 I went through her blog and landed with the most simplest recipe, an Onion tomato Sandwich made with a twist of sambar powder. I have this already on the blog with general masala. Imagine adding Sambar Powder! I was so delighted that I could kill so many events in one shot! I couldn’t chosen so many other interesting recipes from her blog, maybe next time when I plan better. For now let’s enjoy this simple yet delicious Twist with our classic sambar powder. I must say it did gave a wonderful taste. It’s hot from the pan for you! If you can believe something can be cooked and blogged all within 15 mins, then this is for you. I served them as mini pieces and was easy to eat. Heat oil in a non stick pan. Add the onion, saute till they brown. Then add ginger garlic paste and tomatoes. Add the rest of the ingredients. Mix well. Cover and let it cook until the tomatoes are soft and mushy. Spread butter on the bread slices. 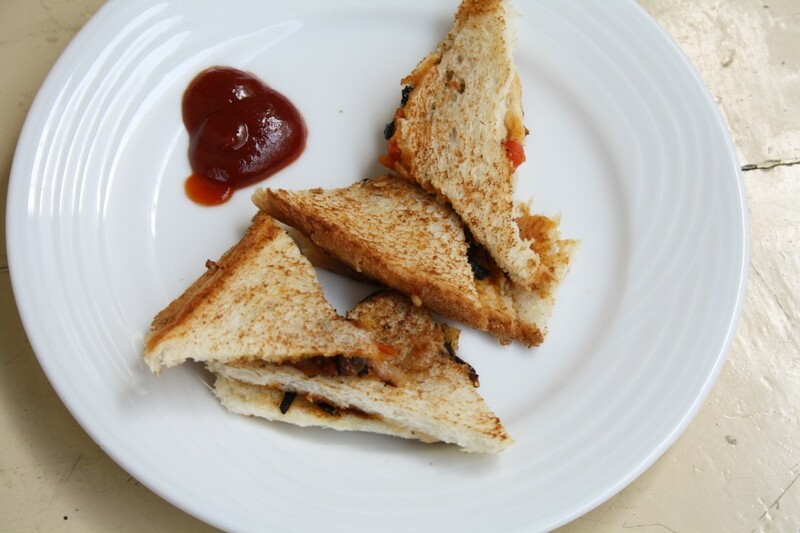 Spread some filling between two slices of bread and toast it in a sandwich maker/ make it as tawa sandwich. Yummy sandwich with a nice twist. Thank you for trying this out, Valli. Glad you liked it. This desi sandwich must have tasted divine with the sambar flavour! My favorite spread on bread. wow, that is a nice twist. I am looking forward to cooking from my pairing blogger this evening and posting about it.